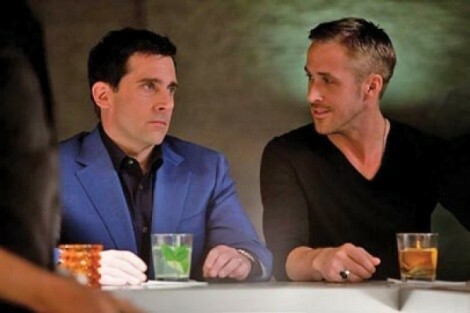 Crazy, Stupid, Love opens with a slightly more interesting variation on the theme, with directors Glenn Ficarra and John Requa (I Love You, Phillip Morris) skimming under the table at a classy restaurant, passing by various classily shod individuals and couples before coming to rest on the New Balance sneakers of Cal Weaver (Steve Carell). For the next two hours, Crazy, Stupid, Love offers up a terrific cast and some genuinely funny moments, but its inability to find real greatness can be encapsulated by that one scene—an attempt at sophistication that’s too often undercut by sitcom simplicity. The dinner that Cal is sharing with his wife, Emily (Julianne Moore), is destined to end badly, as she both confesses to having an affair and asks Cal for a divorce. Cal’s subsequent self-pity sessions in a local bar catch the attention of Jacob (Ryan Gosling), a confident ladies’ man who takes on Cal as his personal Pygmalion project in creating a player. But Jacob is destined to find one girl, Hannah (Emma Stone), who gets under his smooth facade. And meanwhile, Cal and Emily’s 13-year-old son, Robbie (Jonah Bobo), is nursing an unrequited crush on the family’s 17-year-old babysitter, Jessica (Analeigh Tipton)—who happens to be nursing a crush on Cal. That’s a lot of plot to be juggling, but the cast is impressive enough that it’s rare to find any given narrative thread inspiring impatient toe tapping to get back to the good stuff. The best material comes from Stone and Gosling, whose seduction-turned-all-nighter—including a re-creation of the “(I’ve Had the) Time of My Life” dance from Dirty Dancing—proves both hilarious and touching as a crucial moment establishing their connection; it has become increasingly obvious in movies that there’s no such thing as too much Emma Stone. Carell and Moore share their own bittersweet scenes effectively, especially as Carell conveys the emotional walls that may have contributed to their estrangement. Even the teenagers bring poignant awkwardness to their longing. With so many talented people getting so many great punch lines, there’s really only one problem with Crazy, Stupid, Love: It’s a movie ostensibly about genuine heartbreak that keeps acting like it should have a laugh track. Screenwriter Dan Fogelman is a veteran of animated films like Cars, Bolt and Tangled, and as solid as all of those films were, his script here feels like the work of someone who thinks a wackier gag must be a better gag. Robbie gets caught masturbating by Jessica; Cal interrupts a middle-school graduation ceremony to deliver his big heartfelt speech. When plotlines intersect, it’s generally with the kind of crazy coincidences and misunderstandings that inspire plenty of frantic flailing, and not much authentic humanity. Funny cures a multitude of sins, but it can’t create the sting of watching something that feels achingly real. It’s fortunate that Requa and Ficarra help bring some style and emotion to the stronger bits of Fogelman’s script. They know how to get the most out of quieter moments between characters, and there’s a slick montage sequence in which the newly pimped-out Cal successfully applies his new lady-killing techniques at his favorite bar. But even there, Crazy, Stupid, Love reveals one of its little frustrations, as it never seems remotely plausible that a successful womanizer—whether Jacob or Cal—would go to the same place every night and risk bumping into all the previous conquests. There are too many funny people doing too many funny things to be too disappointed in Crazy, Stupid, Love, but it could have added up to something more than jokes. And the people could have been more than their shoes.